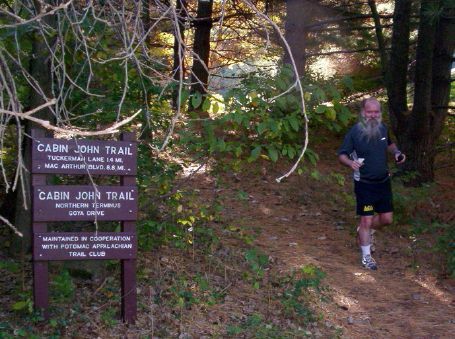 The Cabin John Trail  is only half a dozen miles from my home, but until Comrade Ken tells me about it I don't know of its existence. This morning Ken & I drive to Cabin John Regional Park and set off to explore the upper end of the path. We follow a side trail that's familiar from the "Hills of Cabin John" MCRRC cross-country race downhill to the CJT, where we turn right and cross Tuckerman Lane. We jog along a gravel road through a campground until we spy blue blazes indicating where the official trail leaves the road. Or does it? My GPS is of no value: the batteries died after I got one waypoint, and now I wish I were holding a water bottle instead. The map printout I carry is ambiguous — perhaps we are actually on a connector trail instead of the real CJT. In any event, Ken and I proceed along a rocky, narrow, somewhat overgrown path, following occasional faded blue splotches on the trees. We scramble across the Cabin John Stream at a narrow spot and then join what is definitely the right trail. It takes us across a rickety-looking but solid wooden bridge and soon we arrive at the northern terminus of the CJT. Ken photographs me pretending to run. Then we turn around and head south. Ken sets a fierce pace, and I miss my traditional walk breaks. We get lost briefly a couple of times but enjoy the woodland scenery throughout the process of finding our way back. We pass our starting point and continue onwards, and now the trail is much better maintained and more heavily used. After crossing under high-tension power lines we pass Shirley Povich Field, where I've witnessed the Silver Spring Takoma Thunderbolts and the Bethesda Big Train play amateur baseball in years past. At the Locust Grove Nature Center we reach Democracy Blvd., touch the street ceremoniously, and then reverse course northward again. We get back to the car after 1h40m and watch parents and their kids boarding the park's miniature train. We decide to refrain from riding (this time).